London Painters providing reliable and quality domestic and commercial painting services. Our rates are very reasonable and highly competitive for London and surrounding areas. Professional Painters in London. You can always depend on our expert painting and decorating services. Fast, reliable response, guaranteed painting and decorating services in London. 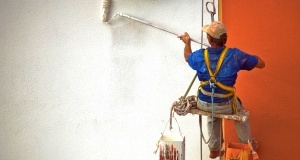 Painters in London offering services for domestic and commercial property painting work and more. Call us today - 020 3918 5759. 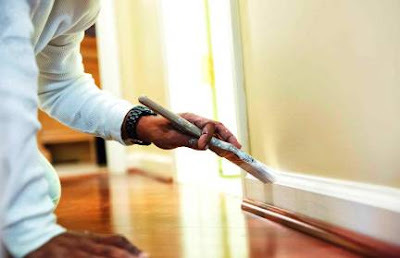 Well trained & experienced painters, providing high quality interior & exterior painting services. We offer rates that are very reasonable & highly competitive for London and the surrounding areas. As professional PDA registered painters, our work is fully guaranteed for client's peace of mind. House selling has become a very competitive market, and though people are desperate in some areas to buy a house, its important you take care to ensure that the you've done all you can to make your house as attractive, safe and saleable as possible. It is said that the average house buyer has no vision - which means you need to make their 'envisioning' themselves within the house as easy as possible. Dark paintwork is a definite turn off - as are stained, worn or smelly carpets - both of which need to be taken care of. On the latter, you could offer an 'allowance' or remove a fraction of the house costs for carpets - or, if you can, invest yourself and replace them, to allow a possibly higher sale price. Walls should be painted off white, or antique white - or possibly very pale and pastel shades if you're planning on redecorating - you may have no option if your walls are stained, marked or damaged. Its also a good time to ensure that everything that you've been meaning to repair is taken care of is actually done - a faulty stair tread, banister or fence in the garden may only be a minor annoyance to you, but can be a danger to anyone looking at the house. Its hard to sell your house without help, but one of the biggest tips you can take to ensure your house sells is to make sure you've removed your 'imprint'. Looking at the house impartially, remove anything that screams 'my personality' and 'my personal space'. Things like photos, pieces of unique artwork, and ornaments and more can be removed before people come to view the house. Remember - they want to buy the house, not feel how you lived there, so if you haven't finished boxing up your non essentials by the time you start showing them the house, its time to consider whether you really need the clutter still unpacked - or whether its time to put it in the bin. Not many of us are fortunate enough to be able to have a magnificent view of Mother Nature's work, the hills, mountains, forests, and other exotic natural wonders that are awe-inspiring and simply breathtaking. If you live in the city, especially a big one, then it's highly likely that when you look around you all you see is concrete, steel and glass. A tree may be visible here and there but it's incomparable to the unspoiled and pure beauty of nature. To experience this, some people spend thousands of dollars to go to an exotic place and have a solemn vacation just relaxing and absorbing the beauty of nature around them. Unfortunately though, not many of us have the money or the time to do this. One consolation or alternative would be having landscape paintings in your home. Generally, having a landscape painting inside your home is a great way to add up to your interiors aesthetics. Depending on the kind of atmosphere you want to bring inside your home, there are numerous types of landscape paintings that you can choose from. If you are concerned about the money you are going to spend, there are reproduction paintings that you can purchase that are every affordable, but they don't really exude the same class and quality of an original. Not all original landscaping paintings have high prices. There are landscape paintings from new yet very talented artists from all over the world that you can purchase and who knows, in the future that artist may become big and famous and your painting can be a classic. Once again though, the choice you make when purchasing a landscape painting depends on you. Are you an avid fan of a certain exotic landscape? You may have gone to Japan and saw Mt. Fuji, then you were greatly impressed by its cone shape, you may have a Japanese landscape painting done and put it in a Japanese themed room. Maybe you want to have the Grand Canyons adorning your living room; this can also be a great idea for a room enhancer. Whichever landscape you want, even your own backyard, you can have an artist do it for you. But it doesn't end there. 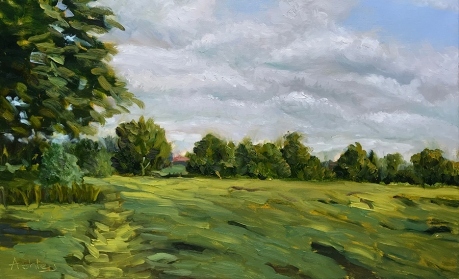 Even if you don't have an idea of which landscape painting you want, you can easily find many different landscape paintings in art galleries in your area, or if you don't have the time. You can just go online and find the numerous websites that offer this type of paintings. Many artists and art galleries have already put up their websites and are showcasing their work in their sites. Here you will be able to browse their uploaded works of art and be able to choose the size, theme and medium of the landscape painting that will perfectly fit the mood that you are aiming for. It doesn't really matter if the landscape painting you got is priced low or is a work of a famous painter, what you need is the depth of the painting that can give life to your room. Remember, what you design in your home reflects your taste and your character. A landscape painting may indeed become the focal point of a room, but it is you who will decide how this is presented. When we paint, we release some sort of energy within ourselves, we express our emotions and we share with other people how we perceive life as we see it with our own eyes. Also, paintings doesn’t have to be exclusively enjoyed by the artists when we paint them, but more so, paintings are for the people who see them, to appreciate them and to understand the beauty of what surrounds us. Usually, when painters create their works of art, they get their inspiration from what they see, be it people, landscapes, trees, animals, flowers and almost anything there is that we see, and some times, what we don’t see. Generally, painters see the beauty of nature and transfer this unto a canvas or any other medium. For those who love flower paintings, you are in luck because many artists choose this theme for their works of art. Still life and flower paintings are very popular themes and many homes have these types of painting inside. In fact, you will be able to choose numerous types of flora and find that there are paintings done about them already, albeit in different styles and moods, some can be bright and happy while some can be dark and droopy, this all depends on what the artist wants to convey. Aside from just an appreciative audience for flower paintings, all aspiring artists can use flowers as the themes of their first paintings. The great thing about choosing flowers as your theme is it would be hard to run out of subjects. With so many types of flora available, you can do a variety of flower paintings. In fact, with the orchid alone, you can choose from the many types of orchids there are. Also, flowers are very colorful so that means you can have a very vibrant looking work of art. What you need to understand is that painting flowers may seem very simple, but to make them look utterly magnificent, you need to learn how to play with your curves and lines to make them look vibrant and real. Play with the lighting as well so you can create a flower painting that seems like you could already smell the flower. If you want to learn how to paint flowers with the greatest of ease, there are many books and DVD’s that you can refer to and discover the secrets in creating realistic looking flowers. If you want, you can also join art classes in your local area. 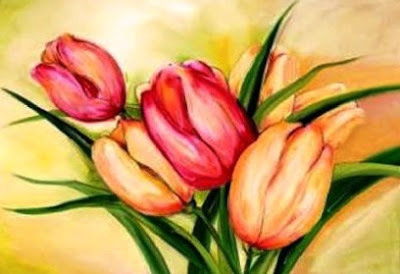 If not, there are online art schools that can help you discover the fun world of flower painting. But why flowers? Each delicate curve, line, shape and color that goes into flowers is a challenge in itself. Nature has made the flowers to provide it with color in a natural way. Men have always been fascinated with flowers and this is evident in many homes as there is usually an image or two found inside of them. Sure photographs can be blown up and framed and can give a more realistic feel, but there’s just something about flower paintings that can never be captured by the lens. Also, if you painted the flower yourself, you will derive a lot of satisfaction knowing that you have created your own personal masterpiece. Do you live in a condo or in a city where a single tree is a very rare sight? Do you want to get out of your concrete world and visit a place where nature is unspoiled and that the view is fantastic and awe inspiring? If you are, then the next best thing to do than pack your bags, leave the city and your work is by getting a nature painting hanged in your living room or in your office. You have to face the fact that in today's world, going on trips to a secluded and unspoiled spot in the world is very expensive. Also, with today's hectic lifestyle, you will find it hard to go on vacation and leaving your work. Surely you wouldn’t want to go on vacation with your laptop with you just to work, would you? If you want to experience the sight of nature every single day, the best thing that you can do is by purchasing a painting that depicts the wonder of nature. If you have a knack for painting, you can try painting nature yourself. The great thing about painting nature by yourself is that you will be able to paint nature that way you want it to be. This means that you will be able to have your very own special place in your living room or in your office. The great thing about most nature paintings is that it is very relaxing. The sheer beauty of the view of a waterfall and lush rain forest is something that cannot be compared to a smog-filled air in the city or a view of skyscrapers and cars bustling around the highways. Whether it is winter nature paintings you want or the view of the ocean and even the Grand Canyon, you can be sure that there are quite a lot of depictions of nature in paintings. Just keep in mind that great nature paintings don't last really long with the artist. With the popularity of this type of painting continuing to rise, it will be quite hard for you to get your hands on one. 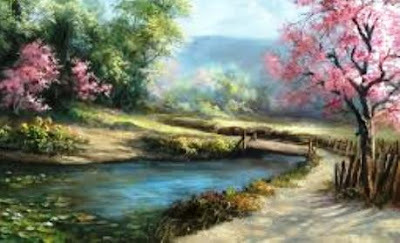 You will see that many people like you will also be looking for the similar nature paintings that you are looking for. So, you might want to visit the art galleries where shows are being held regularly in order for you to choose the painting you want before someone else purchases it. You might want to take a look at some of the works of artists who paints nature through the internet. 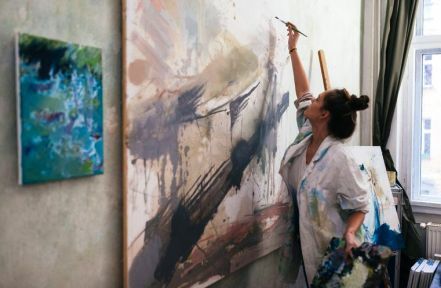 You will see that in order to sell their paintings, most artists will use the internet to advertise their paintings that is available for sale. You have to remember that most professional artists will only make the painting once. So, before it is too late, you might want to purchase the painting you want right away. So, if you want a great addition to your home that will truly relax you and give you a piece of nature, you might want to purchase a nature painting. With this type of painting, you will be able to enhance the appearance of your home and you will also have something that will be able to take your imagination away from the busy city and into the heart of nature. 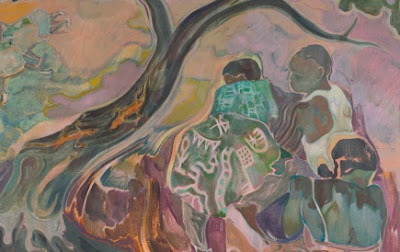 Contemporary Painting, What is it? There are certain terms in painting that are not easily understood by the ordinary people. For instance, do you know what contemporary painting is? Well, these are the paintings produced after the Second World War up to the present times. Contemporary painting is also called modern paintings. It is of exquisite style and represents modern art. The modern artists of today have been creating different types of paintings and you can find them in galleries. Oil paintings are one of the most expensive contemporary paintings because of its high quality. However, most of contemporary art is abstract painting. Aside from those two types of painting, paintings of still life are also greatly appreciated up to the present. You can find a lot of museums around the globe that house modern paintings. Oftentimes, exhibits are held to feature the paintings of modern artists. Through the exhibits, contemporary paintings flourish. You can find museums in New York, Houston, Paris, and Fort. These are the most popular museums that feature contemporary paintings. If you want to see actual modern arts, you just have to visit these different museums. There are many modern artists of contemporary paintings and most of them have created abstract paintings with various themes. 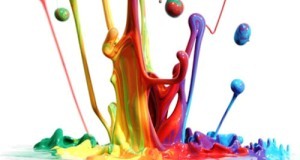 The colors used in contemporary paintings are mixed in a very artistic way. You definitely have to see the twentieth and nineteenth century paintings because it's worth every penny. If you can't afford original paintings, you can purchase replicas of it online. At present, there are now companies that sell replicas of the popular original contemporary paintings. These replicas are more affordable and looks just like the original. There are also centers exclusively for contemporary arts such as paintings and you can find them in Cincinnati and Virginia. Art galleries sell modern paintings. They both have the original and replicas. You can visit the art galleries or you can simply log on to the internet and visit the websites of the galleries. Busy people who don't have the time to visit the galleries can shop for their favorite paintings online. This is much easier and faster. Not only that, you have a variety of choices and you can browse on the entire collection of the galleries without leaving your homes or your office. Contemporary oil paintings are truly expensive especially the originals and so you can opt to purchase the replicas instead. As mentioned earlier, you can get them at a much cheaper price. If you love to collect paintings, try to visit the different art galleries and see what's in store for you. If you have a long-time favorite painting, you can send its photo to one of the galleries and make a purchase request. You can easily find their sites by doing a search on the internet. Find a link that will connect you to your desired art gallery or a certain company that can cater to your needs. All it takes is diligence in doing your search and you can find a good contemporary painting that you can display in your home or even in your office. You can either purchase the paintings for investment purposes or for your personal pleasure. Contemporary paintings are part of history and if you own one, it's something that you can be proud of. So what are you waiting for? Visit the modern art galleries today. Man, as its essence of his or her humanity, is constantly fascinated and curious in all sorts of things. Because of this, man was able to create many wonders in this world and he can use them to his own advantage. Many years ago, man also took interest in painting. In fact, you can see paintings all over the world. During the prehistoric times, painting was already being practiced. Many cave paintings were found in Mexico, India, and France. Today, the cave paintings in Adamgarh and Bhimbetka are still clearly visible. Even the colors used by the prehistoric people look lively and fresh. Surrounding regions such as meadows, moors, rivers, hills, clouds, skies, seas, people, birds, and animals reflect human disposition. The vibrancy and colorfulness of the entire surroundings served as man's inspiration to recreate nature's magic on caves, rocks, canvas, walls, paper, cloths, and many other surfaces. Paintings are given variety through the use of various media such as water colors, oil colors, pastel, and a lot more. Paintings are considered as an art forms. Through the years, the works of outstanding artists were considered phenomenal. Great painters included Leonardo Da Vinci, Raphael, Michelangelo, Dali, Vincent Van Gogh, M. F. Husain, and Pablo Picasso. These painters had their own specializations and they used different styles as shown on their paintings. Paintings have existed for thousands of years now and people have witnessed the emergence of diverse painting styles. Very few painters became popular but this does not discourage other ordinary painters to stop making works of art. Here are the recognized painting styles – Fauvism, Constructivism, Abstract Art, Classicism, Aestheticism, Aboriginal Art, Art Nouveau, Art Brut, Byzantine Art, Baroque, Cubism, Dragging, Dada, Encaustic, Expressionism, Gothic, Impressionism, Marbling, Mannerism, Modernism, Minimalism, Neoclassicism, Primitivism, Stippling, Ragging, Realism, Surrealism, Spattering, Symbolism, Wood Graining, and Theorem. A lot of artists love folk and tribal paintings because of their distinct touch. The natural colors, simplicity, and the local themes being used attracted many art admirers. If you visit India, you will find a lot of folk and tribal paintings dating hundreds of years. When you get the chance to travel to India, try to visit Bihar and Mithila's Madhubani paintings, Maharashtra's Warli paintings, Orissa's Pata Chitra, and Rajasthan's Phad paintings. If you ask tourist guides, you will find out that there are still many painting art works that you can check out. Whether you're a painter or simply an art lover, you will surely find peace and serenity by just staring at the paintings. You can only appreciate the beauty of paintings if you know a true work of art. Sometimes, it's quite hard to understand the meaning of paintings. For instance, not all individuals appreciate an abstract painting. It will depend on the individual's taste and perception. Some people love to collect paintings. 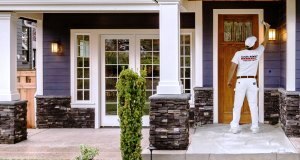 It can add to your home's beauty and overall design. You can find expensive paintings, as well as cheap ones. If you want, you can shop for paintings online because you will have a wide range of choices there. There are also local painting shops that you can visit. But if you're really into painting, perhaps you might want to try it on your own. Find a suitable medium and work on your own painting. Paintings are already part of human existence. People should learn to appreciate it. Research more about paintings online and see how they have developed and evolved for thousands of years. You may have mastered stained glass construction, but stained glass painting seems like a mystery and looks difficult. Most stained glass crafters know little about the process and the materials needed for painting stained glass; but it should be just another step in the whole process of creating beautiful stained glass windows. Some people have a misconception that stained glass is clear glass that has been painted to a desired color. Actually, stained glass is colored while it is still in its molten form by adding metal oxides. Painted stained glass is already colored and has had a design painted on it. Painting on stained glass is done to add humanistic details of the face, hands, feet, or shading of the body and hair. Painting reduces the amount of cutting and leading of many tiny pieces of stained glass. Painting enhances the beauty, textures, and color that are already in the stained glass. You don't have to be a talented "artist" in order to paint on stained glass windows; although, a little drawing experience and some knowledge of perspective and the human anatomy can be helpful. If you can find classes on stained glass painting, it always helps to learn from someone who has already learned what works and doesn't work. If you cannot find classes, look for information online, on related online forums and in instructional books at craft stores, stained glass shops, or in your local library. You can spend as little or as much as you want on stained glass painting tools and supplies. You can get started for as little as $20 to $100. You can save money by making some of your own stained glass painting equipment. Suppliers for stained glass paints and tools can be found by searching on the internet and at craft and supply stores. Be careful of the paints you choose because the paints for stained glass painting are specific. Stained glass paint is a high-fired permanent paint which actually has glass (called the vehicle) in it. Stained glass paint also contains lead and has coloring agents like sand, alumina, clay, red or white lead oxide, boric acid, potassium and sodium. The lead in the stained glass paint refracts light. The matt (paint) can be applied, taken out in the tracing, fired, and then applied again, depending on the lighting, detail, and textures you want to achieve in your stained glass painting. 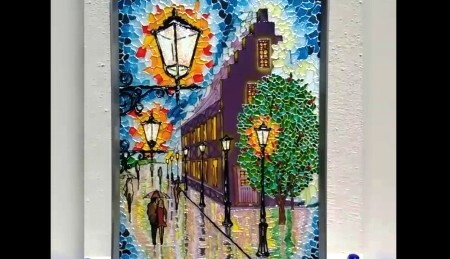 A few good brushes, spatulas, a small easel with a thick-plated glass surface, a light box and an inexpensive small, electric kiln would be a good start on supplies needed to do stained glass painting. In order to save money, you could build your own easel and light box and purchase a used kiln from ads in stained glass magazines or online. You can also make your own mahl sticks and bridges which are wooden supports for your hand and arm for helping with paint stroke technique. Your work area does not have to be large. It could be an area set aside in your stained glass workshop with a good source of natural light from a window. You need plenty of storage including a palette box for storing the color palettes you make. You will need squares and rectangles of scrap clear glass, ground and rounded on the edges to prevent cutting yourself. These scraps will be for practicing your stained glass painting and tracing technique. Armed with the knowledge you gain from sources and practice, you will find that there really is no mystery to stained glass painting. Professional Painters in London serving London and the surrounding area successfully for years.